I, like a lot of parents, am concerned about the vegetables my children eat. And I mean digest — not berate, ignore, or push under the plate. My friend Catherine, a registered dietitian, reminds me to not get too focused on the vegetable quota for a given meal, or even the day’s meals. Instead, she advises to look at the big picture of food consumed over time. I try to do this, and do pretty well, especially when I lump vegetables and fruit together, then tally the intake: Fruit 5, Vegetables 0. Hey, that's a total of 5 servings of fruits and vegetables a day! 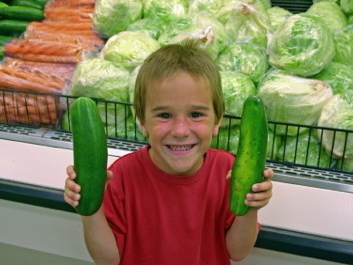 For a while I convinced myself that as long as cucumbers were on the menu — the only vegetable (though technically a fruit) besides corn that both my children devour without discourse — we were still in the game. 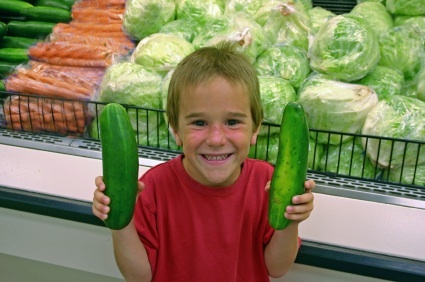 It was a sad day when I discovered cucumbers rank right up there with iceberg lettuce when it comes to nutritive value, the near-equivalent of a glass of water with a bit of fiber. Alone, I would happily eat brown rice and sautéed greens every day. Alone, I would read novels instead of Ellyn Satter’s book How to Get Your Children to Eat . . . But Not Too Much. Alone . . . well, this is getting me nowhere. There are times I buckle, especially after seeing another article on the benefits of eating lots of dark, leafy greens or orange squash. And I get especially prickly when I’m the victim of some bragging parent who itemizes all the veggies her child “loves.”  Who’s the bigger bore, little Timmy or little Timmy’s mother? Me?! As for my kids, exactly how young do I want their brains to stay? Is there a formula for vegetables I could plug into — maybe half the amount recommended? — that keeps them young at heart but encourages maturity where backseat squabbling and household chores are concerned? I’ve tried some of those crafty recipes, like the one that sneaks broccoli into macaroni and cheese, but let’s be honest: Will your kids straddle the first hurdle (homemade mac and cheese) to relish the second (foreign green objects trespassing in an already dubious dish)? Whether it makes sense to us or not, a lot of kids of a certain age do not like foods mixed together, which is why plates with dividers are so popular with the elementary set. One of my favorite recipes, spaghetti sauce with chicken sausage and Swiss chard, came about in an effort to make a one-dish meal that included representatives from the basic food groups. I took my parents’ spaghetti recipe and updated it, substituting chicken for hamburger and adding celery, carrots, and chard. Do the kids like it? My daughter, who is 11 and generally more receptive to eating a variety of foods, does. My son — who acts like I’m trying to poison him when I put vegetables on his plate and is not above a bit of drama (“You don’t love me, do you?”) — dips his bread into the sauce and eats the bread. If the sauce, however, is paired with pasta, he says, “I don’t care for it,” and pushes his plate to the side. Recently I saw a recipe for vegetable fried rice that got me thinking. The kids love rice. They’ll tolerate vegetables such as broccoli, asparagus, and carrots in small doses. What if I combined the two? Feeling even sneakier, I realized that white rice with soy sauce doesn’t look that much different from brown rice, so why not work whole grains into the mix as well? I looked at several different recipes, weeded out any ingredient that might leer at the children, and put together my own version of veggie fried rice. Do they like it? Let me put it this way: they ate it. And I like it. And you might. And if your kids eat it, I’m counting that as a serving of vegetables in the big picture.